Discussion in '2017+ Sync 3 / In Vehicle Technology' started by Vinayak, September 21, 2017. It appears v2.2 is the current version released by Ford to SYNC3 Explorer owners. If you get a reply re the downloading of V2.3, please share that info with us. Many of us are on V2.0 and when we check for an updated version via the Sync screen, nothing is found. Thanks. I went and checked for Software updates today on my EX and came out no new updates. "To be able connect sygic with sync 3 you will need version 2.3 or higher. Please try to contact your dealer to find out if you are able update it." I'm waiting for the confirmation from Ford on this...I will update forum on the outcome from Ford. Are you sure they are not actually saying you need SYGIC v2.3 or higher? The official SYNC3 v2.3 version is also available in the link above. 3.0 is shipping on some vehicles now. I am using this version and it also works with the Sygic Car app on iOS. CarPlay seems smoother too and voice commands are improved. Ford has not released the update via the website or automatic updates over WiFi yet but I have had success in updating a 2017MY from v2.0 and my 2016MY with SYNC3 retrofit from v2.2. No issues yet and I've been running v3.0 for a few weeks. This is what it looks like when updating. It takes a while for the update to start but you can continue to use SYNC while updating. After the update, it will let you know that the new version will be available the next time you start your car. So there was a North American v2.3 of SYNC3? 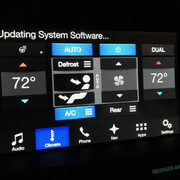 For 2016/2017 models that shipped with 2.0 there is no user update thus leaving it at 2.0 and the dealer software update level is 2.2. There has been no user or dealer update to 2.3 or 3.0 released. Those updates floating around were pieced together based on previous release design and if you choose to install them you are doing so at your own risk and should any SYNC related issues arise and you go to the dealer, do not expect to get any assistance. Updated mine today from v2.0 to v3.0 so far all is good. Few minor GUI changes.....will update more if I see anything noteworthy. Just as an aside when you plug in the USB don't be impatient like me. It is actually updating even though there is NO acknowledgement on the home screen until 2-3 minutes of updating has taken place. I put mine in the USB and after 2 minutes thought it was not updating so I pulled it and got an error saying I interrupted the update. After re-installing the USB it then showed UPDATING SYSTEM SOFTWARE as was mentioned above. How did you get 3.0? The link in Platinum Owners post....goes to Mustang site. One nice feature is the icon on home screen for the heated steering wheel, now one-touch off/on no more multi screens. interesting, downloading not for my 17 sport. I will download v3.0 today and get it installed over the weekend. Something fun to do over the weekend.